Most people need to cut their intake of carbohydrates. Carbohydrate foods in those who are sensitive to them can cause all kinds of problems including weight gain, metabolic syndrome, fatigue, and yeast infections. Yuk! Carbs can do all that because they cause dramatic increases in blood sugar and insulin levels. One of the worst carbs in this respect is bread. But most everyone I talk to loves bread. So what if there was a way to decrease the carbohydrate effect of bread? Boy, do I have some good (as in delicious) news for you. 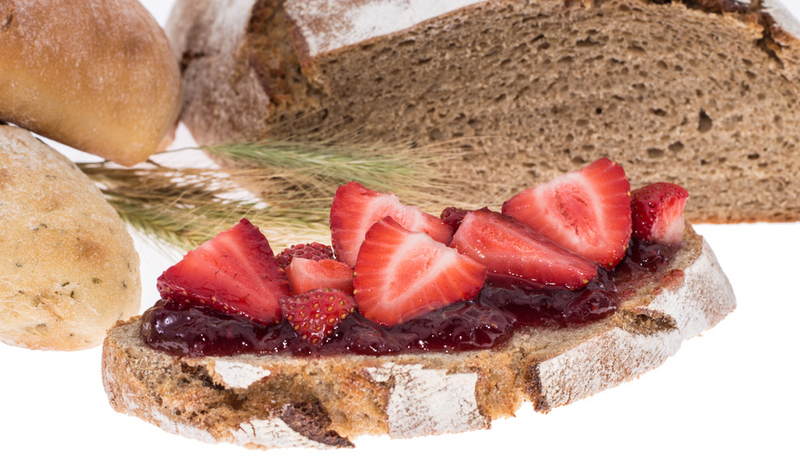 Recently, researchers looked at what happens to blood sugar and insulin levels when you eat bread with berries. They were interested in this because laboratory studies have shown that the polyphenol molecules so abundant in berries can reduce the digestion and absorption of starches. If they can do that, they should be able to decrease the sugar and insulin effects of bread. So here's what they did. They took a group of healthy women and measured their blood sugars and insulin levels before and after eating 50 grams of white bread. Eating 50 grams is about two slices of bread. Then they repeated the experiment, but the second time the women ate the bread along with 150 grams of puréed berries. That's about three-quarters of a cup. They tested strawberries, bilberries, lingonberries, raspberries, cranberries, black currants, cloudberries, and chokeberries. I have to tell you I had no idea that God made that many berries! Here's what happened. Strawberries won hands down. They decreased the sugar/insulin effects of the bread by 36%! The only other berries that were that effective was a combination of equal amounts of strawberries, bilberries, cranberries, and black currants. But that's not all. The researchers not only did the test with white bread, they also tested the effects of berries on rye bread. And the results with rye bread were twice as good. Additionally, past research has shown that eating bread after a meal also reduces its effects on blood sugar and insulin. So here's the deal. If you can't take it anymore and just have to have your bread, do it this way. After your meal, take a slice of rye bread, dress it with one-third cup of strawberry purée, and count your blessings. Törrönen, R., M. Kolehmainen, et al. "Berries reduce postprandial insulin responses to wheat and rye breads in healthy women." J Nutr. 2013 April;143(4):430-6.